Background: Poor adherence to inhaled corticosteroid (ICS) therapy is a barrier to effective asthma management and a risk factor for morbidity and mortality. 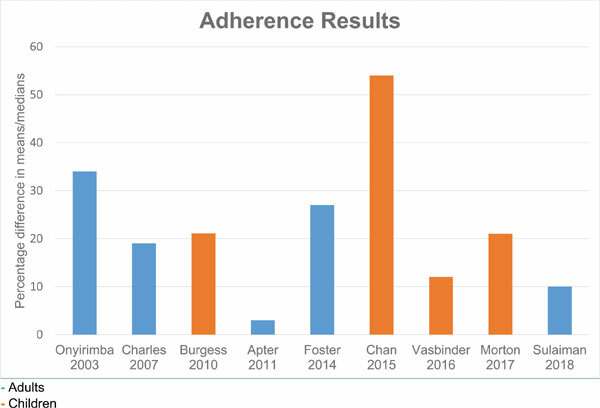 Attempts to improve adherence have had little measurable effect due to difficulty accurately measuring adherence and the complex nature of non-adherence. Electronic monitoring devices (EMDs) have been used in research to objectively monitor inhaler actuation; however, data on the effectiveness of EMDs in the clinical setting are sparse. Objective: This article reviews published, controlled studies employing EMDs as part of an intervention aimed at optimizing adherence in asthma and attempting to influence clinical outcomes. Method: Ovid Medline, Scopus and Web of Science were searched (July 2017) for studies using keywords related to asthma, inhaler technology, electronic monitoring and adherence. Data regarding study design, adherence and clinical outcomes were extracted. Results: Ten published studies representing 1469 randomised participants are included in this review. All but one study reported a significant difference in adherence between intervention and control groups; however, only two studies, both in children, were able to report sustained, significant improvements in clinical outcomes. One did so in asthma morbidity score and the other in asthma-related oral corticosteroid use and hospital admissions. Conclusion: Although EMDs show improvements in adherence, there is little current evidence to support that they reduce morbidity. Evidence of clinical effectiveness is needed to justify their common use in clinical practice and maximise their potential benefit. Carefully considered study design will be integral to demonstrating such clinical effectiveness. Adherence, asthma, compliance, control, electronic monitoring, m-health.